COMMENTS:        This trigger occurred at longitude,latitude = 174.31,-10.78 [deg]. Dec(J2000) = -18d 01' 41.7"
with an uncertainty of 1.9 arcmin, (radius, sys+stat, 90% containment). The partial coding was 48%. The mask-weighted light curve shows a single pulse structure that starts at ~ T+12 s, peaks at ~T+33 s, and ends at ~T+65 s. T90 (15-350 keV) is 47.04 +- 12.12 sec (estimated error including systematics). The time-averaged spectrum from T+12.46 to T+65.18 sec is best fit by a power law with an exponential cutoff. This fit gives a photon index -0.21 +- 1.56, and Epeak of 34.5 +- 5.6 keV (chi squared 44.84 for 56 d.o.f.). For this model the total fluence in the 15-150 keV band is (8.2 +- 1.3) x 10^-7 erg/cm2 and the 1-sec peak flux measured from T+32.88 sec in the 15-150 keV band is 0.8 +- 0.3 ph/cm2/sec. A fit to a simple power law gives a photon index of 2.21 +- 0.21 (chi squared 57.66 for 57 d.o.f.). All the quoted errors are at the 90% confidence level. with an uncertainty of 4.1 arcsec (radius, 90% confidence). The light curve can be modelled with a power-law decay with a decay index of alpha=2.8 (+0.8, -2.1). The results of the XRT-team automatic analysis are available at http://www.swift.ac.uk/xrt_products/00728268. 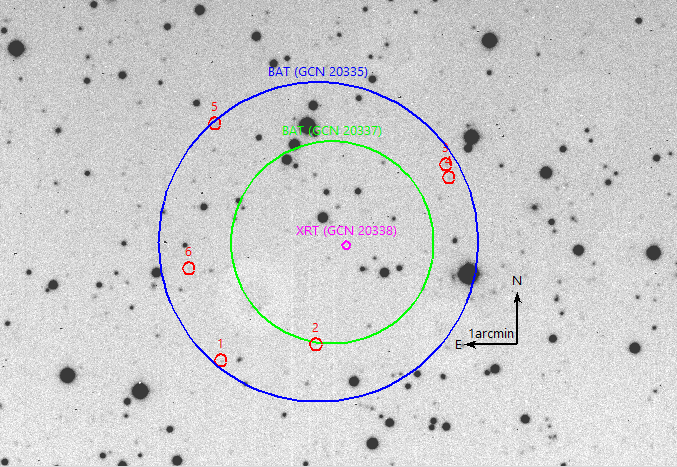 The Swift/UVOT began settled observations of the field of GRB 161224A 28.3ks after the BAT trigger after a Sun constraint (Cholden-Brown et al., GCN Circ. 20335). At the position of the XRT source (Cholden-Brown and Evans, GCN Circ. 20338) no uv-optical source was found to the upper limits below. The magnitudes in the table are not corrected for the Galactic extinction due to the reddening of E(B-V) = 0.096 in the direction of the burst (Schlegel et al. 1998).